Gandhi was a source of inspiration for Martin Luther King Jr. The Communist government of Kerala is not known for greeting American delegations with open arms. But last Sunday leaders from this tropical state in south India rolled out the red carpet for a special visitor: Martin Luther King III, the son of the American civil rights leader. AP/R. 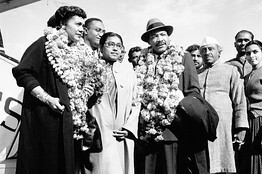 Satakopan Martin Luther and Coretta King arrive at New Delhi, February 1959. The King family has a long, but little-known, history in India. Martin Luther King Jr. was deeply influenced by Gandhi’s freedom struggle and spent a month in India from February 1959 learning firsthand about his doctrine of nonviolent resistance against British rule. Mr. King’s trip to India this month retraces his father’s pivotal journey to India 50 years ago. Mr. King is accompanied by a delegation that includes John Lewis, the U.S. civil rights leader and congressman from Georgia; Andrew Young, a former ambassador; and the musician Herbie Hancock. King was exposed to Gandhi when he was a student at Morehouse College in Atlanta and later while at seminary. “The message was so profound and electrifying that I left the meeting and bought a half dozen books on Gandhi’s life and works,” wrote King. A group of African American leaders, including the dean of Howard University, met Gandhi on a trip to India in 1935. The Indian leader urged his guests to try civil disobedience in the U.S.
King came to India after leading the momentous boycott against segregated buses in Montgomery, Alabama in 1956. But the 1960 sit-ins, the 1961 Freedom Rides and the 1963 march from Birmingham for civil rights still awaited him. During their trip, King and his wife Coretta journeyed across India to meet with leading Indian politicians, scholars and activists — as well as farmers, students and factory workers. They traveled to nine cities including Delhi, Ahmedabad, Mumbai, Kolkata and Trivandrum, the capital of Kerala. King had studied Gandhi’s philosophy and techniques years before his trip to India. But the 1959 visit galvanized his efforts in the U.S. civil rights movement and broadened his perspective on combating poverty and injustice. King’s original visit left a deep impression on India, too. In 1959 he was warmly welcomed by prime minister Jawaharlal Nehru and president Rajendra Prasad and other top Indian leaders across the country. King remarked that Indians had closely followed the progress of the Montgomery bus boycotts and seemed even more aware of the campaign than many Americans. King’s historic trip to India is also documented in a multimedia exhibit at the American Center in New Delhi, “Journeys to Freedom.” The exhibit, on display until March 17, draws on archive photographs as well as King’s books and letters. Together they bring to life Gandhi’s influence on King and his galvanizing month in India. Ms. Dey was especially moved by a short film featuring King’s 1963 “I Have a Dream Speech” in Washington. Though she specializes in U.S. history, it was her first time to see complete footage of the speech. “It was amazing,” gushed Ms. Dey. To highlight the overlap of influences that traveled halfway around the world, “Journeys to Freedom” documents Gandhi’s freedom struggle in India and his use of satyagraha (“truth force”) to win independence from the British. The black-and-white images in the exhibit also show King kneeling at Raj Ghat, Gandhi’s memorial in Delhi, and draped chin-deep in marigold garlands upon arriving in the capital. One rare photo shows a laughing Nehru standing between King and his wife, who are both dressed in dark suits. Fifty years later, Mr. King’s condensed two-week trip to India has also re-energized his own work. Mr. King heads Realizing the Dream, a nonprofit based in Atlanta that promotes conflict resolution and community development.